I’m sure we can agree that when you need it, finding a radiator stop leak that works quickly, easily, and does the job right the first time around at a cost effective price are most important. That was our top criteria for selecting the best radiator stop leak. If you are ready to get to it immediately and need a fix quick, K-Seal Coolant Leak Repair scored high above the others we tested in all categories and is our top pick. If you have small leaks in your radiator and are losing water, you can use a product called radiator stop leak to correct the problem. If the leaks are pinhole sized or seeping leaks, this product will more than likely be all you need to take care of the problem. It is easy to use; just add it to the coolant in your radiator and follow the directions. Adding radiator stop leak to your cooling system will form a coating that fills in small leaks and holes in the radiator. Many of the stop leak products for radiators on the market are nothing more than a way to plug the hole; they should not be looked at as a permanent solution. There are many different brands of radiator stop leak on the market. Knowing a little about the different kinds and companies that manufacture them will help you sort through the different kinds and select the perfect radiator stop leak product for your emergency radiator leaks. It is an important product to have in the event of an emergency and can take care of many leaks in water pump gaskets and other problems. 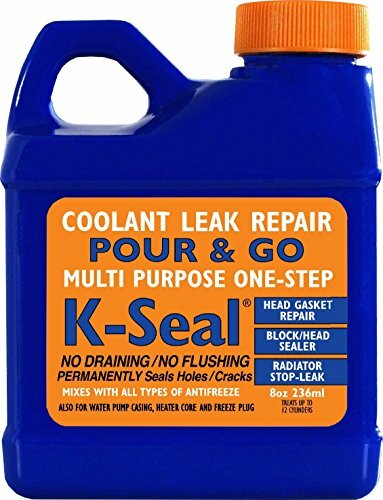 K-Seal provides a reliable coolant leak repair product that mixes easily with the antifreeze to plug small holes and cracks. That may show up in the heater core, cylinder heads, head gasket, freeze plugs and more. It is super easy to use; just shake the bottle and pour it into the coolant system. It requires no flushing or draining and works great for emergency leaks. One 8 ounce bottle has up to 20 quarts of cooling capacity. Sometimes it’s not possible to fix leaks right away. Stop leak can get you back on the road again and not leaking important fluids from your vehicle in no time. If you have any kind of leaks in your heater core, freeze plugs, head gaskets or blocks, you want to get a reliable radiator stop leak product to take care of them. Bar’s Leaks Liquid Copper Radiator Stop Leak will take care of these leaks and more. It is designed to take care of larger leaks so you can get back on the road without costly repairs. Whether it’s repairing a blown head gasket or a heater core leak, Bar’s Leaks will take care of it quickly and easily. It is fully compatible with all antifreeze and is easy to use too. Just pour into the radiator and you’re all set and you won’t need to worry about any draining of the radiator first. 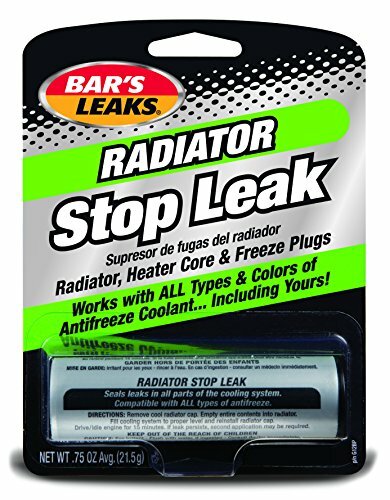 Bar’s Leaks offers vehicle owners another alternative to fixing coolant leaks with this Radiator Stop Leak Powder. Not only does it seal leaks, it conditions the cooling system, lubricates the seals in the water pump, assists in controlling electrolysis, and reduces corrosion and rust too. It works well with any type and color of antifreeze and one bottle will treat up to 3 gallons. It is super simple to use. Just add it to the radiator and that’s it. Use this product to seal leaks in radiators, gaskets, heater cores and freeze plugs as well as other leaks that arise in the coolant system. Taking care of small leaks before they become big leaks is very important. This great product from Bar’s Leaks will help you take care of these leaks in a simple way. It is not uncommon to get small leaks and cracks in the coolant system of your vehicle. Radiator Stop Leak products are designed to take care of these leaks, by sealing the small holes that can become a larger problem if left unattended. All three of the top rated products that are reviewed above are great for taking care of those small leaks, cracks and seeping leaks that can occur in the coolant system. The Bar’s Leaks Liquid Copper stop leak product can even take care of larger leaks as well. Finding a reliable product for stopping the leaks in your coolant system is very important when it comes to keeping your vehicle running well. Stop leak products have been around a long time due to the fact that they work well and provide a fix for the small leaks rather than having to spend a lot of money right away. To learn more about radiator stop leak and how to choose the right one for your needs, read the buyer’s guide below. The information we provide you with will help you understand how this product works and how to choose one that will work for your vehicle’s needs. Knowledge is key when it comes to making an informed decision as to the best radiator stop leak product for your vehicle. There is a little bit of controversy surrounding the use of radiator stop leak to take care of small cracks and leaks in your coolant system. Depending on who you ask, the opinions are divided; some will be all for it and some won’t be. The general consensus is that it is a great product to use when you have small leaks in the radiator or other parts of the coolant system. It is very easy to use and only involves choosing the right one and pouring it into the radiator. Many people don’t understand that radiator stop leak is not a replacement for getting the problems repaired. It is only a temporary fix for these leaks and should not replace getting the vehicle checked out and repaired. One thing to keep in mind before you use stop leak is if your vehicle is warranty, using stop leak of any kind can void the warranty. If your vehicle is under warranty, check thoroughly to make sure that using a product of this nature will not ruin you having this warranty intact. If it does, you are better off not using it and calling for a tow truck. One drawback to using radiator stop leak is that it can cause the coolant system to become clogged. This can happen to the radiator, heater and/or engine. One way that you can minimize, if not entirely prevent this clogging of the systems is by flushing the cooling system and changing the antifreeze. It is recommended that you get your cooling system power flushed if you have to use stop leak and then take it to get the leaks officially fixed. Draining the fluid is good, but power flushing is much better for keeping the system running correctly. It also helps to remove any extra stop leak from your system. If you have never used a stop leak product you may be worried that it won’t work. The good news is that radiator stop leak does work when it is used correctly and for the right type of leaks. It’s been used to fix small leaks and cracks for years and is still used often today to get rid of these small leaks. Radiator stop leak is not designed to replace getting your vehicle repaired but it is an excellent product for taking care of small leaks that may not need to be formally repaired by a repair shop. It is not for leaks that are too large and that require you to keep adding the product to your coolant system but many use it as a way to prevent nuisance leaks as well. The way radiator stop leak works is by sealing and preventing the leaks in your coolant system from becoming worse and causing your vehicle to break down. It is a much better option than constantly having to add water or coolant to your radiator. It is a great emergency fixer to have in your vehicle in case of a breakdown that causes a leak in your cooling system. The material in the bottle heats up and liquefies, spreading out and forming a seal that plugs the holes and cracks. If you use radiator stop leak and find that it doesn’t work, this just means that the leak is too large for the pellets in the stop leak product to plug and seal the holes. This can happen but if the leaks are just starting or are small, you will find that the product works great to get you running correctly again. All three types are used the same way, which is to add them to the coolant in your vehicle. It is important to follow the directions on the bottle since many of them advise to add the product and then drive for a short time to allow it to work. With all of the choices available for radiator stop leak on the market, it is important to purchase the best quality product you can. Don’t look for budget radiator stop leaks, although they are available. Use the best quality, brand name stop leak that you can find and then make arrangements to get your vehicle looked at as soon as possible so the leaks can be assessed. If you find that adding radiator stop leak seems to have fixed the problem and you don’t have to add anymore, you may be able to wait awhile before having the leaks repaired. Another important point to remember is to use the recommended amount ONLY. Adding a lot doesn’t mean it will fix the leaks better, it will only cause potential clogging and problems down the road. The way the product is designed, the recommended amount will fix the small cracks and leaks so no more coolant leaks out. Vehicles can get all kinds of small leaks and cracks in the various systems. Cooling system leaks are very common and in many cases can be fixed with the addition of radiator stop leak. It is not guaranteed to work for all leaks, but if the leaks are small or seeping leaks and the product is used correctly in the right amount, it will almost always fix the problem and stop you from having overheating problems and the hassle of having to carry around water/coolant to add to your radiator all the time. With all the radiator stop leak products on the market, you may feel like it doesn’t matter what you choose to add to your radiator but that isn’t true. The better quality the radiator stop leak is, the better it will do the job of fixing these small leaks and cracks. The purpose of this buyer’s guide is to provide you with the information you need to understand how radiator stop leak works and when to use it. It also helps you understand the importance of choosing a product from a company that is reputable and has a good history of quality products. The three top rated radiator stop leak products we have reviewed above are all great examples of the type of high quality, reputable products you should use in your own vehicle. They are designed to handle the small leaks, cracks and even some larger leaks that your cooling system can incur. It is much less expensive to add a bottle of radiator stop leak to your vehicle and give yourself some time get together the funds for the more expensive repairs it may need.